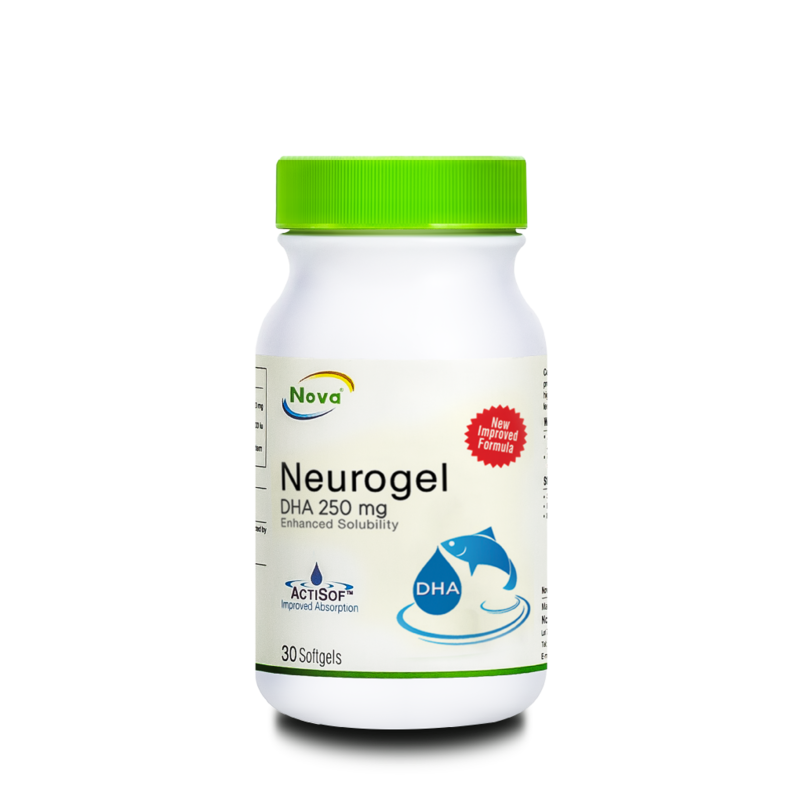 Osteoporosis is a condition in which bones become fragile, leading to a higher risk of breaks or fractures. 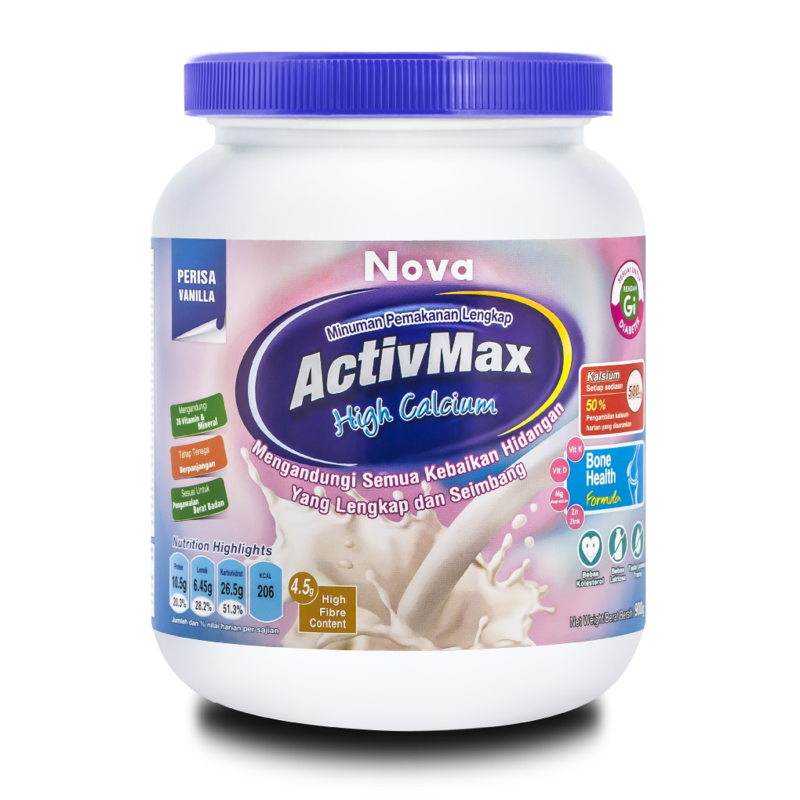 ActivMax High Calcium Coffee is a complete, balanced and low glycemic nutritional drink specially formulated for ladies, elderly, people who are concerned about bone health and the population who are at risk of osteoporosis. Just the rich aroma of coffee alone is enough for you to look forward to drinking it every day. ActivMax High Calcium Coffee is a tasty and healthy calcium drink that is specially formulated for maintaining bone health. 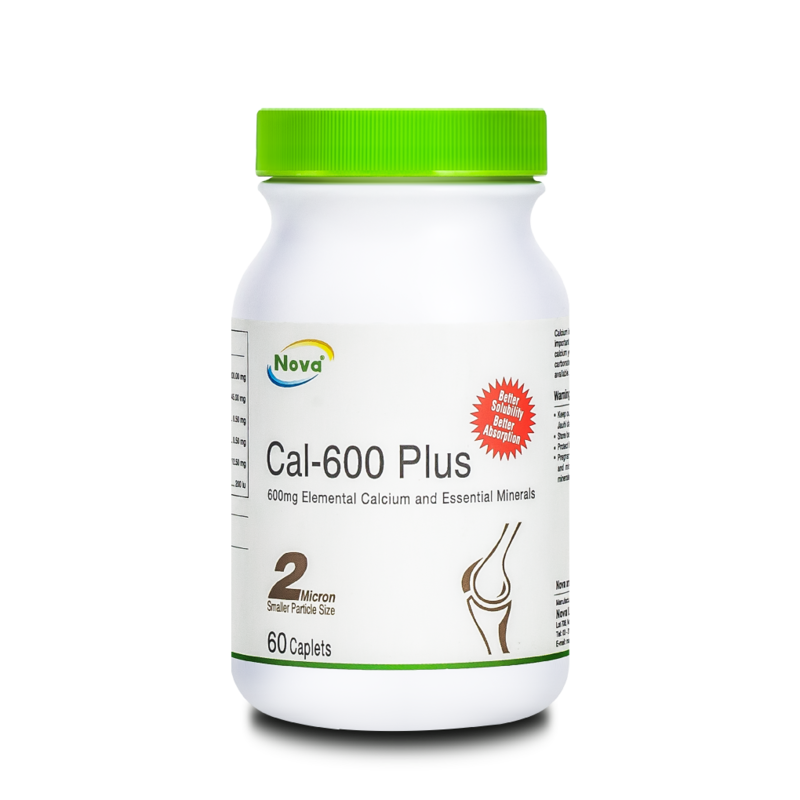 It is incorporated with a high amount of calcium helps in supporting strong and healthy bones and improving strength to keep doing what you love. One serving of ActivMax High Calcium Coffee provides 500 mg of elemental calcium which is equivalent to 50% of your recommended daily calcium intake. Isolated soy protein, sunflower oil (high oleic acid), corn starch, fructose, maltitol, maltodextrin, polydextrose, calcium casein, gum arabic, sodium casein, soy lecithin, wheat fiber, tricalcium phosphate, tricalcium citrate, calcium carbonate, magnesium oxide, potassium chloride, sodium chloride, carnitine, inositol, vitamin C, vitamin E (D-alpha tocopherol), ferrous fumarate, niacin, zinc oxide, potassium hydrogen phosphate, calcium d-pantothenate, manganese sulphate, copper sulphate, vitamin B6 (pyridoxine hydrochloride), vitamin A, vitamin D3 (cholecalciferol), vitamin B2 (riboflavin sodium phosphate), vitamin B1 (thiamine hydrochloride), chromium picolinate, folic acid, biotin, potassium iodide, sodium molybdate, potassium selenite, vitamin K1 (phylloquinone), vitamin B12 (cyanocobalamin), turmeric extract (20% curcuminoid), grape seed extract (95% proanthocyanidins), bioflavonoid (rutin), permitted flavouring agent (coffee powder). Add 50g (2 scoops) of ActivMax High Calcium Coffee to a glass of warm water (240ml), stir vigorously until the powder is completely mixed. Drink while it is fresh. 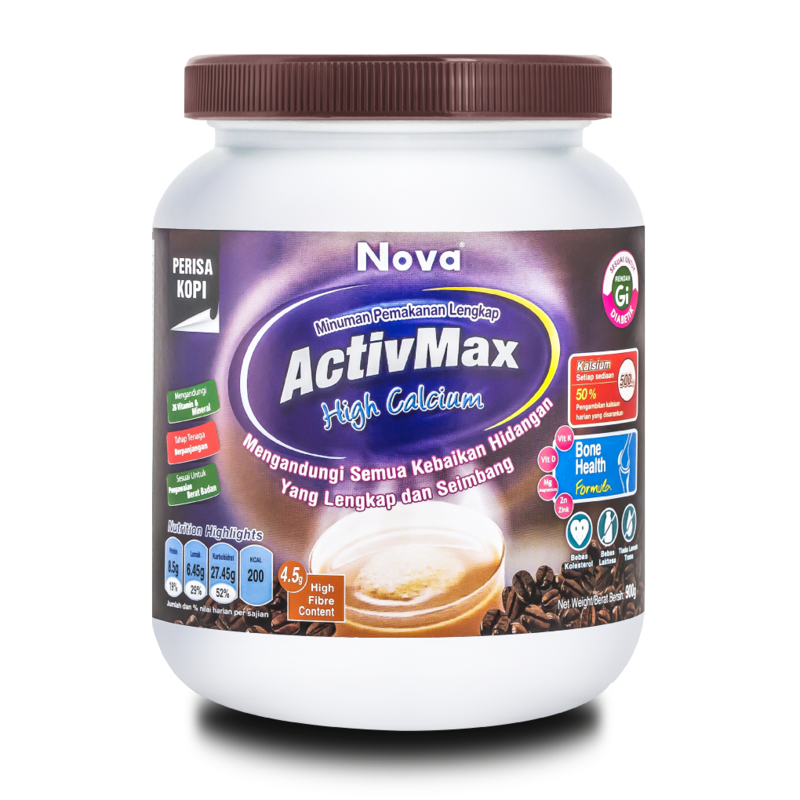 ActivMax High Calcium Coffee can be taken at any time of the day as meal replacement for men and women above 12 years old.